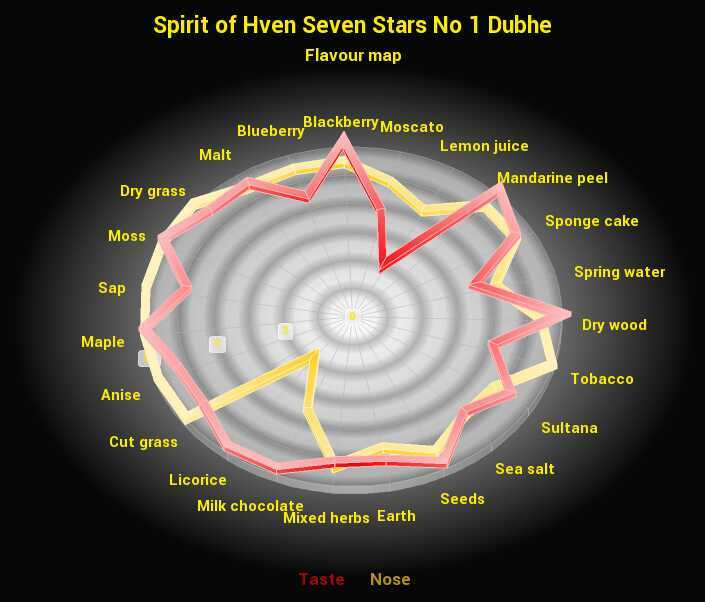 I once thought that no one could compete with Islay in creating a superbly balanced smoky whisky… until I tried Spirit of Hven Seven Stars No 1 Dubhe. Sweden leads the world in many things, including innovation and social policy. It is no surprise that this whisky is delightfully unique, exhibiting the aroma and flavour of nature: sharp grain, sappy wood, subtle earthiness, musty herbs, the brightness of sweet fruit. This offers shades of fruit and grain with bursts of dense peat and smoke. It is unique and different from what you would expect from Islay or any other peated whisky in the world! It is, I think, more earthy with lashings of grain and complex vegetation on the tongue; a vegetation that expresses every step of the life cycle – infant seedlings, wet moss, fruit and grain and dead dry glass. This whisky is now listed in my “TOP WHISKY” list. 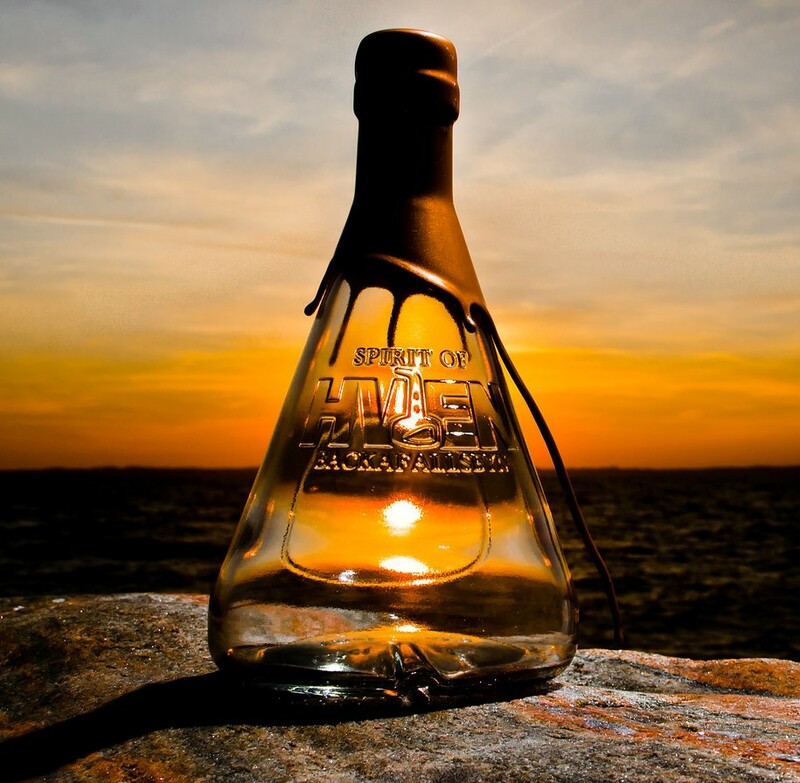 Spirit of Hven is a distillery located in Sweden. It is nestled on what sounds like a beautiful island sitting between Denmark and Sweden, the island of Hven. Drawing from the name of this island, this whisky clearly reflects every facet of the natural resources that have gone into producing this whisky. 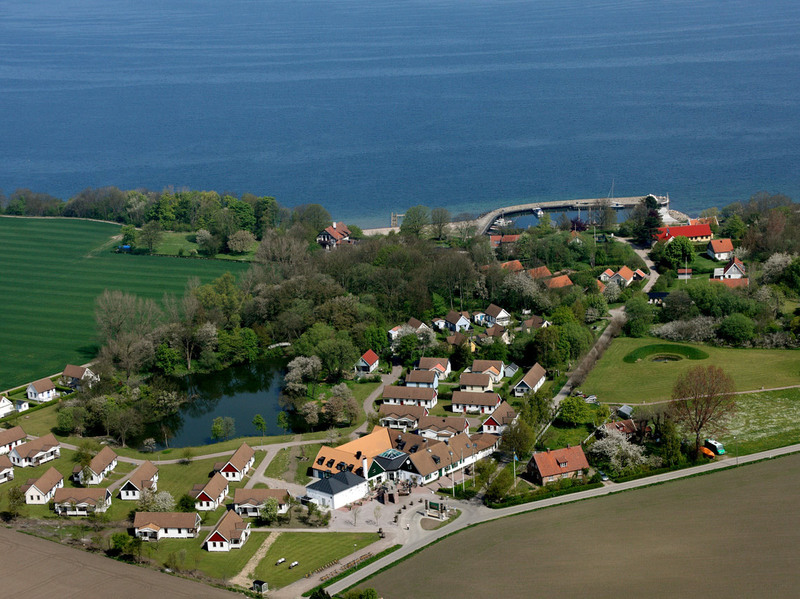 The island of Hven has 371 inhabitants and the island is 7.5 kilometers squared. The picture to the right shows a Hven from above; a beautiful European village which looks pristine and very snug indeed! Now for the important part, my detailed tasting notes. I blind tasted this whisky alongside Ardbeg Galileo, Nikka Pure Malt Black and a number of other whiskies. I can say that the Spirit of Hven 7 Stars No 1 Dubhe was the most balanced of the lot. So, in the blind tasting, it was between the Arbeg and the Hven! The Nikka All Malt Black was much too sweet and unbalanced, with a dull and slightly boring demeanor. While the Spirit of Hven did have a slightly less impressive nose than the Ardbeg, I felt that its balance of flavours was slightly (by a whisker) better and this contributed to a magnificent taste. The Arbeg was I think a little sweeter by a whisker, whereas the Spirit of Hven had an earthiness that balanced against the sweetness beautifully. However, the Ardbeg was more powerful and its flavours peeled away a little easier, which in turn allowed more exploration of complexity. I really like the way the earthiness in the Spirit of Hven moderates the sweetness (though the Hven was weaker on the finish and a little brittle, so overall I preferred the Ardbeg). Spirit of Hven pride themselves on producing organic products, and these efforts certainly shine through in their whisky. The whisky exhibits a culmination of all the facets of a small European island – the earthy grain slices through the dense lush green as plumes of smoke burst with peat and ask which whisk away the fruity sweetness that waits patiently in the background, but never overpowers. So lovely! That peat is complex, with cascading shades of peat striking the palate; it starts dry then with the splash of a salty ocean wave it becomes lush cut lawn from which vegetation sprouts and bears fruit; corn, wheat, barley. It is that earthy and herbaceous vegetation that sharply cuts through the peat smoke and sweet fruit, balancing the whisky so beautifully. Here are my more detailed tasting notes. That lovely complex peat hits the nose gently, as dry grass intertwines with lush green cut lawn and the earth from which it grows! There is even a little fruit; some blackberry and blueberry which, together with some grain and malt, really makes this whisky one that exhibits the “life cycle” of vegetation. I love that aspect of this whisky. That vegetation is met with some saltiness and the malt adds some much needed savoury as the sap and maple bring some interesting zing! That grainy anise seed on the nose morphs into a sweet dense licorice on the palate, which smacks against the tongue with the beautiful cascading peat. The sap and maple gently glows in the light cloud of smoke that cracks into a dusty haze and shining through it is sharp citrus peel and more dull blackberry that lets mixed herbs (parsley in particular) tingle on the tongue with sponge cake… until it is washed away by thin milk chocolate and spring water. Ever present is that earthiness, seeding, and seeds. The finish on this whisky is good, but it does die a little early. Combined with its slight lack of oomph, the finish is a little weaker than I would have liked. This is bottled at 45% alcohol volume, so I was expecting some more power. 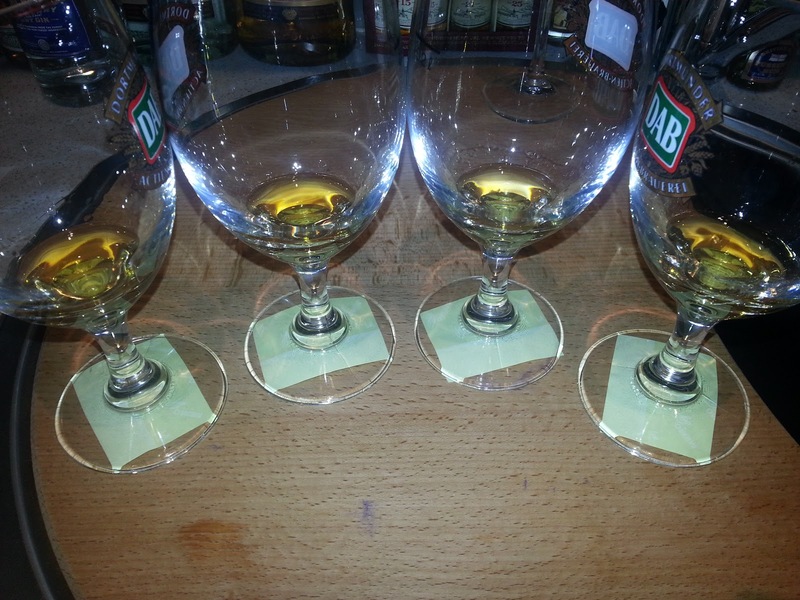 This entry was posted in Swedish whisky. Bookmark the permalink. Going there to visit the distillery at the end of June … maybe I can get a cask-strength sample. I hope you enjoy the visit. Please do let me know how it goes.